The Grand Traverse Commons Recreation and Natural Area is a 140-acre park that was dedicated to Garfield Township in the early 1990s. 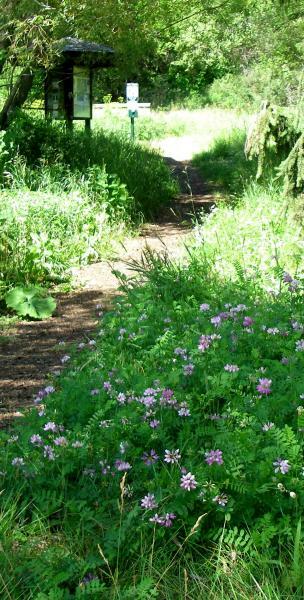 Miles of unpaved trails, many covered with woodchips, wander up, down, and around wooded hillsides, streams, meadows, and wetlands. The park is a part of the overall Grand Traverse Commons Redevelopment District and was originally a part of the former State Psychiatric Hospital. Hiking, biking, nature watching and cross-country skiing are all enjoyed at the park. Adjacent to the park on the east is The Village at Grand Traverse Commons, a redevelopment of the old State Hospital area containing a mix of retail, office, and residential uses. Adjacent to the park on the west is a 38-acre wooded parcel owned by the State of Michigan that is also available for public use. Parking and trailheads to the Natural Area exist on North Long Lake Road, near the intersection of Medical Campus and Orange Drives, near the Barns area, on the west side of the TBA Administrative building, and on the northernmost side of the Copper Ridge development. Dogs are welcome but must be leashed. Restrooms are not available on site. Update: Following an earlier forest management plan, a hazardous tree assessment was completed to identify fall hazards to trail users. A tree service was contracted to remove nearly 500 of these trees, and this work was completed in early 2016. There is also a lot of momentum to begin a comprehensive park planning process for the Grand Traverse Commons. We envision a multi-use, regional attraction featuring sustainable hiking and biking trails, including greatly improved navigation. With the groundwork and budgeting set for this process in 2015, it will get underway in 2016.